In Japanese folklore, ghosts, light angels, and nether-creatures are called "yokai". 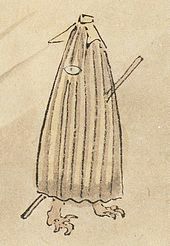 Yokai are the spirit forms that inhabit the world of spirits in Shinto religion. Folklore of Japan has countless types of yokai, making it one of the richest cultural examples of creative spirituality on the planet Earth. This differs from Western culture and it's black versus white, good versus bad, and darkness versus light duality which so many people are tired of comparing themselves to. Anyway, this edition of the blog focuses on different yokai creatures: Yokai-Spotting! Meaning "Kami of the tool" or any object that reaches its 100th birthday and becomes self-aware. 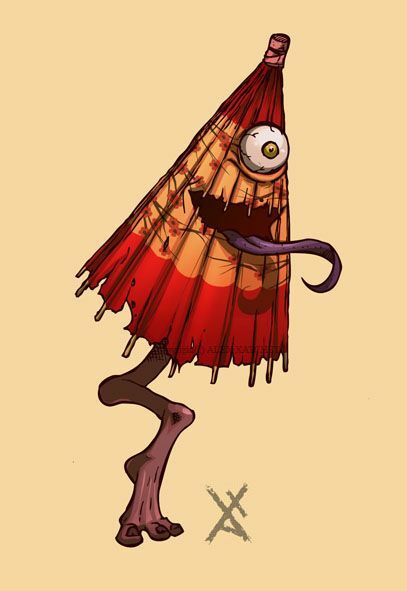 Maybe "Kasa-Obake" (Umbrella Ghost) is a discarded umbrella that fell by a wayside, finding a quiet spot under a bridge where it gained the expanse of time and experiences with animals that it needed to take on a life of its own. That or a grudge that it retained from its previous owner. Generally, they're not too harmful (as yokai) and Japanese schoolchildren like to doodle them in their notes or creatively. "Kasa-obake" is one of the Kirby series baddies that made frequent cameos in the older gameboy, SNES, and even the newer installments. This baddie gives Kirby the ability to wield an umbrella against his foes.